Figuring out how to finance your college is a consideration for every student. It is a barrier to entry for some students and a perceptual obstacle for others. We have published several articles about college readiness, free college tuition programs, how to graduate college debt free, private college discounts, the value of college, and how to reduce the cost of college. In this resource guide, you will learn how others pay for college and how to prepare yourself for success. Data herewith has been gathered from the United States Department of Education, Sallie Mae, Federal Student Aid, NCES, and individual surveys from Statista. Information on the attached graph reveals the various sources of funding and trends from 2011 to the latest complete school year of 2016. 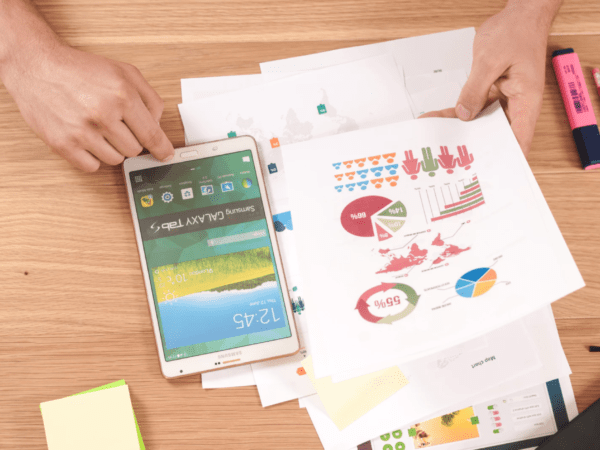 We will spend time to break down the many funding sources clustered into six color-coded segments to provide a valuable visualization of these trends. As you can see below, the graph starts at 2011-12 on the left and moves to the most current completed school year on the right. The colors help denote each category and relevant trends in college funding sources. Let’s start with the chart below and break down each section below to highlight changes over time. A Breakdown of How College is Financed Today. The blue band in the above graph represent the scholarships and grants received by students. These funding sources are the single largest individual contributor to tuition payments for college students. Grants can be provided by the college, university, state, or federal agency. On the other hand, scholarships can be from large public institutions to private family funds. The key is to understand what programs exist and apply to those providing the most benefit for your college education. Scholarships and grants have accounted for more and more as time passes. In fact, since 2011 the amount of grants and scholarships provided to college students has increased year over year. The biggest gains have come in the previous three years with the scholarships and grants increasing by nearly 12% from 2014 to 2015 and 11% from 2015 to 2016. This fact helps to explain why tuition discounts at private colleges across the United States is at an all-time high. Tuition discounts at private universities is currently averaging 49% from the published rates. Contributions from friends and relatives is the smallest portion of the overall financial picture. Looking at the graph, the black band represents this category and starts at $764 in 2011 and represents just over 3% of the overall contribution in that school year. Fast forward to 2016, the percentage relatives and friends contribute is 4% of the total cost of college. While some students receive a substantial amount of financial assistance from friends and relatives, the average college student sees a small percentage from this group. The gray band in the graph above represents the portion of the overall cost of college coming from working and savings. Students across the country have seen a slight uptick in personal contributions since 2011. Looking at the 2011 school year, the average college student contributed $2,555 towards the cost of college. Compare that to the most recent year reported, 2016, where students chipped in $2,887. The interesting thing to note here is the fact that the dollar amount has increased but the percentage of the overall cost remains at 12%. The second largest contributor towards the cost of college comes from parents. Savings and income from parents is denoted by the red band in the graph above and has vacillated since 2011. In other words, we have seen contributions from parents decrease from 2011 to 2012 and from 2015 to 2016 with increases in between. Parent contributions towards college finances peaked in 2014 at 32% of the overall cost and settled in at 28% for the 2016 school year. Going forward, you can expect financial contributions from parents to continue to be a substantive piece of the overall cost of college. As a surprise to most, parent borrowing has decreased from 2011 to current in both dollars and percentage. Back in 2011, an average parent borrowed $1,832 representing about 8% of the total cost; meanwhile, in 2016 the average dropped to $1,610 which is 6.7% of the overall cost of college. This may be related to the fact that colleges and universities continue to provide more generous financial aid packages coupled with an increase in family savings and income invested in a student’s college education. The final factor considered in this study was student borrowing. Funds borrowed by college students is denoted by the light orange band on the graph. As you look at the data for student borrowing, it see-saws year over year. 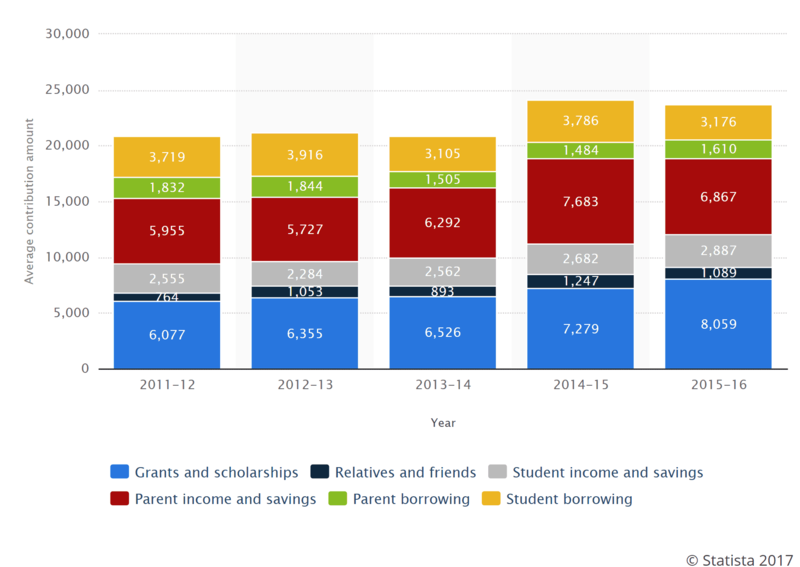 Increases in student borrowing can be seen between 2011 and 2012 along with 2014 and 2015. Meanwhile, decreases are observed the years in between the increases. The general trend has gone from 18% of the overall cost of college in 2011 to 13% in 2016. We would expect this to continue to zig-zag over time as several underlying macro and micro-economic factors affect student borrowing year over year. The overall cost of college continues to rise and fall yet the overall contributions provided by colleges and universities swells year over year. In 2011 the total grants and scholarships accounted for 28% of the overall cost and in 2016 the total eclipsed 33%. Students have been contributing more for college and parents less, in terms of percentage of the total cost. At the same time, parents and students are borrowing less to attend college.